Two weeks ago, I went to Boston to learn a new technology and acquire more skills regarding this state-of-the-art practice in my subspecialty. The technology is something about the use of ultrasound. Ultrasound, which uses sound waves for imaging, is not by any means a new technology. Man is not the only creature to use sound waves to detect objects either. Whales, dolphins, and bats use sonar to echolocate and navigate their way. The term ultrasound applies to sound waves that is beyond the audible range of human hearing which is 20,000 Herts. The frequencies used in medical diagnostic ultrasonography is 2 to 18 mega Hertz (2,000,000 to 18,000,000 Hertz). These sound waves are really beyond what we can hear, even for bat ears, which can hear up to 120,000 Hertz. When we think of ultrasound or ultrasonography, we usually think of the technology of imaging babies. This imaging using sound waves is invaluable in assessing the developing fetus as it does not use potentially harmful x-rays. Another popular medical use of this technology is imaging of the beating heart, which is called 2-dimensional echocardiography. But with the advancing technology, the ultrasound probes are getting smaller and smaller that they are now mounted on flexible scopes, and can be inserted to almost anywhere in the body. Yes, anywhere you can think of. The course that I attended is about bronchoscopic use of ultrasound or Endobronchial Ultrasound (EBUS). The ultrasound probe, which is as small as a pencil eraser, is mounted at the tip of a bronchoscope. There are many other applications of ultrasound in my field of specialty, especially its use in the Intensive Care, but that was a separate course that I took about two years ago. 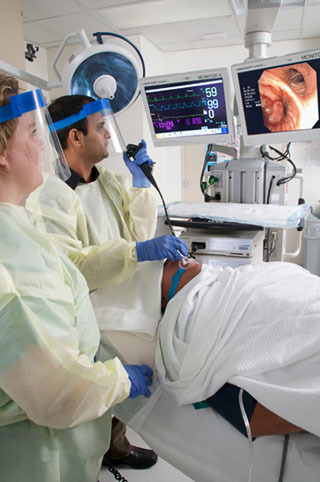 Bronchoscopy is the procedure that uses a bronchoscope, a flexible fiber-optic tubular instrument, with a video camera and light on its tip, which is 2 feet long and half as thin as your pinkie finger, to visualize and examine directly the inside of the air passages and lungs without surgical incision. It is through this that we can also biopsy the lungs, or a lung mass,or a lymph node inside the chest cavity. This scope is inserted through the nose or mouth and is advanced down the throat (larynx) and into the air passages (trachea and bronchi) of the lungs. Of course the patient is sedated for this. We are not that sadistic. With EBUS added to the bronchoscope, aside from viewing directly the inside of the lungs, we can also obtain ultrasound images to locate tumors (not babies!) and lymph nodes, and accurately biopsy them. It is really a neat technology. When doing bronchoscopy and EBUS, we insert the fiber-optic scope with the ultrasound probe into the patient while we look into the video monitor. It requires a good hand-eye coordination, just like when you are playing a video game. I guess playing those video games when I was younger have helped me with this skill. And they say that there’s nothing good that comes from video games? Just don’t let my son know this, or else he will use this against me when we tell him he is spending too much time playing. I don’t know what other technology will be developed in the future that will affect and change the practice of medicine. Maybe they will develop an instrument that is handheld that is as big as the old Texas scientific calculator, that you can wave over the patient’s body and make an instant diagnosis. Just like the “tricorder” used in Star Trek. Yes, just like in Star Trek. Another very informative post, thank you again for sharing. I wonder which one is better; the Endoscopy in our hospital uses In-Reach/I-Logic by SuperDimension. It uses Electromagnetic Navigation or (ENB) Electromagnetic Navigation Bronchoscopy. It has three sensors a thumb like sizes that they position on patient’s chest and uses triangulation of the catheter. It enables the physician to have minimally invasive access to lesions deep in the lungs as well as mediastinal lymph nodes, so that they can get sample tissues. Electromagnetic navigation bronchoscopy is better in reaching small peripheral lung masses. The instrument is more expensive though, so less facilities can afford it. I know the vendor of this technology met with us not so long ago, but our hospital was not yet ready to invest on this at this time.